In following up on my latest post; entitled “The One” and which highlighted my all time favorite kitchen, I thought that I would dedicate the next two blogs to the close runner-ups. This one here is the product of the collaborative effort of William Litchfield Residential Designs and Jacquelynne P. Lanham Designs. I just happened to come across it while roaming through the AH&L archives. 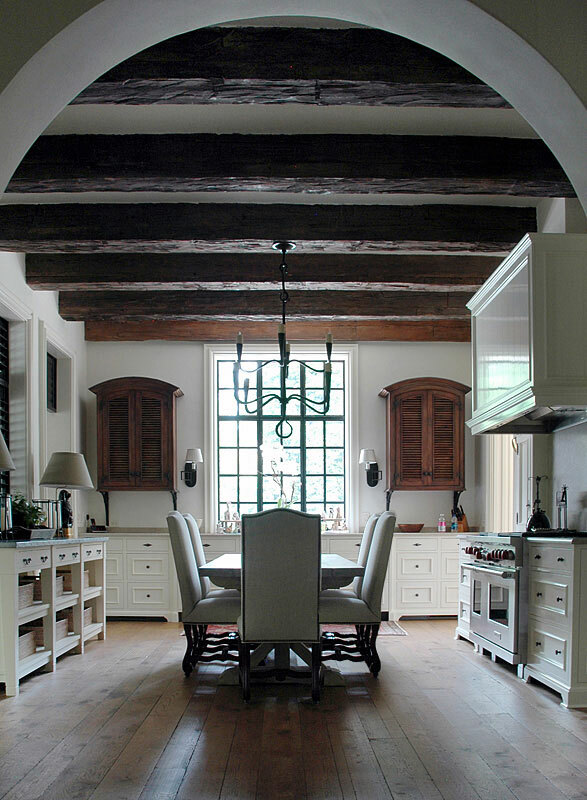 When I look at this kitchen, I see a true gentleman’s estate. One that is full of complexity and sophistication ; yet, comfortable. One that is complete in integrity. One where the whole composition is working well, undivided, integrated, intact and uncorrupted. From the Portfolio of William B. Litchfield Residential Designs, Inc.
As with the previous post, the entire design is hinged on the concept of Contrasts and Compliments. Our perimeter cabinets here present themselves as being very stately whereas the units flanking the window are vintage, treasured and reminiscent of heirlooms that have been passed down through the generations. 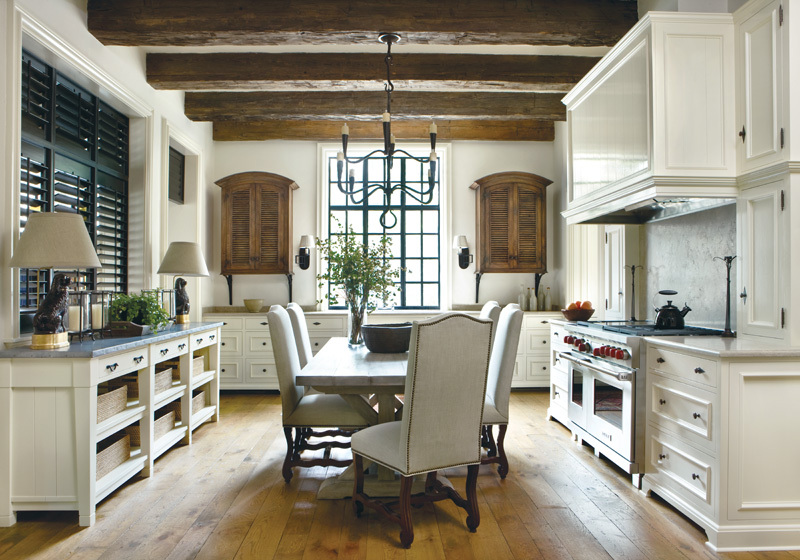 The rustic beams and the iron window give you the feeling of permanence, while the dining table brings us forward into modern times by resembling the ambiance of a corporate board room. Can’t you see the man of the house, in charge of his life, sitting here mapping out his day. I also love the open sideboard piece, the complimentary countertops, the wide plank flooring and the lighting collection. The chandelier, sconce lights and table lamps work perfectly together. This is actually the prep kitchen which is lying just around the corner. Where the main room is the more public arena, this is the realm where the true work takes place. Tons of storage. Absolutely everything is tucked away in its place and yet the space does not feel closed in at all thanks in part to those magnificent windows. I can envision standing here, looking out over the field and watching the guys as they return from the afternoon pheasant hunt. Couldn’t you. Notice again how the windows are set directly on top of the countertops. 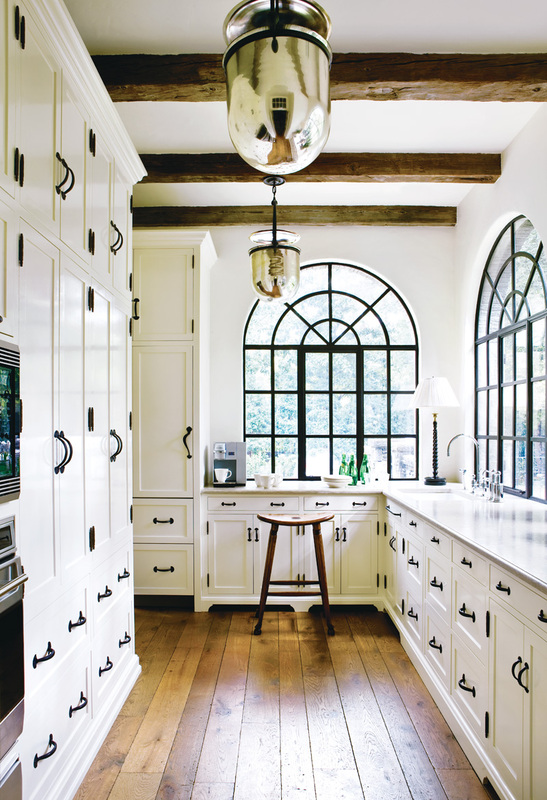 And, to complete the integrity of the architecture, the arched windows mimic the openings on the far side of the kitchen tying the entire composition together. Continuity of detailing between spaces is critical in creating comfort. If you Like, feel free to Like, E-mail, Friend or Follow. Mostly Follow since Twitter trumps everything. And as always, I’d love to hear your thoughts ~ Please comment below.